I stood at the checkout line, praying that I had stayed within the weekly grocery budget. Meanwhile, gorgeous glossy magazines of beautifully designed spaces taunted me and my limited resources. I looked at the spreads touting low-cost rooms and realized that the ‘low’ was still way too high for me. 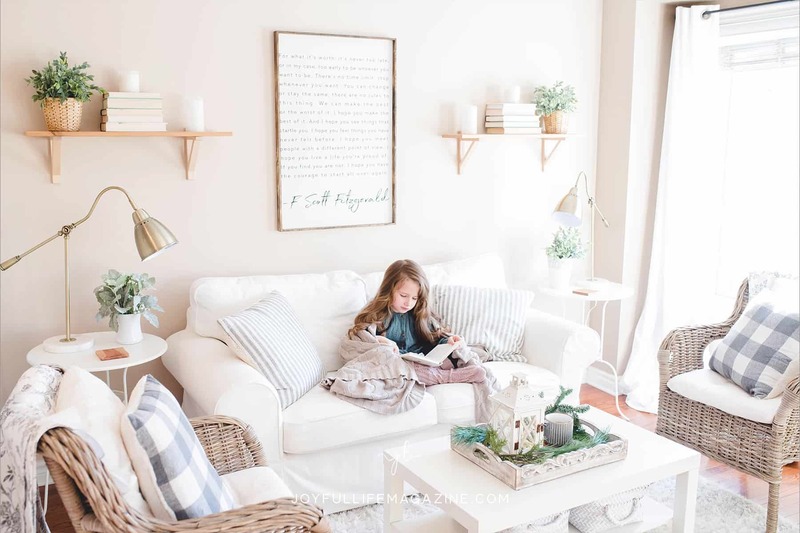 What do we do when we long for beautiful spaces in our homes to welcome and feed the souls of this world, but we can only manage to squeeze a few decorating dollars into the household budget each month? When my husband and I were newly married and bought our first home, we didn’t have wiggle room in our budget to buy furniture or decorative items. To make the place as attractive as my heart desired, I had to get creative! Over the years I’ve learned a few practices that have helped me beautify my home without breaking the bank. Just about anything can be transformed with a coat of spray paint. The makers of this magical potion have designed it to adhere to nearly any surface. Scour your own basement or attic, or visit garage sales and thrift stores to search for items with a pleasing shape. Even when the color is hideous or just not right for you, an item can receive new life through a simple coat of spray paint in glossy black, white, or any inspirational color. Tada! Now you have an attractive, decorative item for your home. I once found a large ceramic white and brown dog that I bought for a song at a thrift store. I painted over some childish marker scribbles on its chest and now he graces our living room with a new sleek black silhouette. We have affectionately named him Dimitri. Gather similar items of various size (vases, candle holders, plates, etc.) and paint them all the same color to use en masse for visual impact. Renew wicker baskets or furniture with a fresh coat of spray-on magic. Take mismatched pieces of furniture such as a random mirror and chest of drawers and paint them with the same color to make a perfectly matched set. When we moved into our first home, our rooms held very little furniture. To fill the empty spaces and make the place feel cozier, I simply added plants. I found it easy to maintain a combination of real and artificial greenery. I purchased an amazing 4-foot-tall cactus from Ikea to fill up the corner of our family room, which stayed with us for many years. As we slowly acquired furniture we enjoyed moving it from room to room. Live plants are often available for a reasonable price at grocery stores or home improvement retailers. I wasn’t always a fan of artificial plants, however, I’ve found they can work miracles in your home. They require no effort (except an occasional dusting shower) and add beauty, hide eyesores, and fill in empty spaces. A few large leaves from the dollar store tucked into a pretty vase can transform the look and feel of a room. Start mining for treasures in your local thrift, charity, or second-hand stores. People with larger budgets are often redecorating and you can benefit from their cast-offs. Second hand, household linens are budget-friendly items that can go a long way to update and beautify your spaces. A room is never complete until the windows are dressed. I personally dislike fully covered windows, except for privacy’s sake, but panels of fabric always add softness to a room and complete it like a frame completes a picture. Fabric adds texture and absorbs sound, which is helpful if your space is sparsely furnished like ours was for so long. Decorative throws are another great find at thrift stores. Nothing makes a couch, chair, or bed look more inviting than a cozy blanket artfully tossed on top. Wall art, decorative items, and furniture are readily found in second-hand stores. Your town may even have a re-use center or “take it or leave it” areas that can also be great treasure-hunting grounds. Cozy cushions and throw pillows on a sofa entice us to come and sit awhile, take a minute to rest or cuddle up with a good book. On a bed, decorative pillows stacked just right invite story time with the kids or heart-to-heart talks with your spouse. It’s almost as if they whisper to us and give permission to take a break and slow down with the ones we love. Having space for connection is, after all, the most important part of having a beautiful and welcoming home. Having space for connection is, after all, the most important part of having a beautiful and welcoming home. To find reasonably priced cushions, scour thrift stores for washable pillow inserts or cushions that are ugly on the outside but have a nice fluffy center that can be covered anew. You may even score some of these from your Mom or Grandma. YouTube videos can show you how to make no-sew cushion covers, or you can ask a friend who sews to whip you up some covers. You might offer to barter for a project or favor that you do well. Consider thrift curtains, tablecloths, fabric scraps, blankets, or even shower curtains to give your cushions new life. Most of the tips in this list depend on the principle that all things have potential. Look at the shape, the practicality, or pleasing lines of an item and consider how you can give it a new life to help make your home beautiful. Get inspired by all the ways you can give items a completely new purpose. Use a nice outdoor scroll garden trellis as interior décor. Hang a quilt on the wall or use one as a tablecloth. Vintage window frames make lovely accents on a wall. Collections of books raise a lamp to the right height and a stack of suitcases instantly makes an interesting side table. A crystal dish glued on a candle holder creates a lovely receptacle for watches, keys, or makeup. Bare branches cut from your woods fill a corner with texture when gathered into a simple basket or pot. The only limit to creative home design is your own imagination. Ideas abound on Pinterest to inspire you with ways to give household items a new lease on life. Allow your individual creativity to shine, making your home as beautiful and unique as yourself. Your home is a haven where you and your family are nourished in body, soul, mind, and spirit. Creating a beautiful home, even on a limited budget, is one way to feed your soul and fashion a cozy environment for the ones you love. I hope these ideas help you to begin creating beauty with the resources that you have. I love what The Nester (Myquillyn Smith) says about home improvement, “It doesn’t have to be perfect to be beautiful.” I’d add that it doesn’t have to break the bank, either. I like to think of myself as a prospector for beauty. Treasure can be hidden under many layers and only requires a prospector to bring it to the surface. I seek to unearth the sometimes-hidden beauty in the garden, home, found treasures, fibre art and the lives of others. My passion is to reflect God to the world by creating and calling out this beauty. I live in a small town in sunny Alberta with my overflowing closet, robust shoe collection, and retired husband. I am the proud mother of two grown daughters.